I think if you guys know anything about me, you know then when I find something I like, I have a tendency to shout it from the mountain tops. Well, I've found something I like. Actually, found it about 4-5 months ago and it's really been helping me with my diet (as in food choices, now restrictions from food). Have you guys ever tried it? I've tried other greek yogurt brands and frankly they all grossed me out. They had a very sour taste or were WAY too thick and gooey, and—and this is the most important for me—they were all WAY too expensive. Their texture is thick and creamy, but not heavy at all. The fruit flavors are amazingly fresh tasting. I don't feel like I'm eating sugared down yogurt or artificial flavors. And I love the size of tub that it comes in, it looks larger than regular yogurts although it's the exact same ounces as the rest of them. The best part is the HUGE amount of protein in every serving—14 to 19 grams!!! It keeps me fuller longer and is a great recovery after my morning runs. Before I go much further, I have to say that they asked me to taste test 2 of their newest flavors, raspberry and strawberry-banana. And they sent me one container of each flavor. Who am I kidding, I would have done this even if they didn't ask me or send me free product. First I tried the strawberry-banana. I have never been a fan of strawberry-banana flavored anything. It always tasted like it was too sweet and had a fake flavor like kool-aid. Not so with Chobani's strawberry-banana. I could taste fresh bananas mixed in with fresh strawberries. It was amazing. Then I tried raspberry. Oh my gosh was it divine! The raspberries tasted like I was eating fresh raspberries straight from the produce section. These weren't sugared down, sweetened raspberries, these were real honest to goodness tart raspberries. Lets face it, raspberries, by themselves, are not sweet. But mixed in with the sweet creamy flavor of the yogurt it was the perfect balance. I don't think these flavors are available in the grocery stores yet. And so far, in my local stores I've only been able to find blueberry, strawberry and peach. But as luck would have it, those are my 3 favorite flavors anyway. They also have honey, pineapple and pomegranate. I can't wait to try the pomegranate. Oh, and I tried the pineapple in December when I won a whole case of yogurt FREE from a game I played on their website. It's called SPOONS. You have to follow @ChobaniNicki on twitter and whenever she says "ok, Spoons has started" you click on the link which takes you to their website and all you have to do is click on a spoon and you win a free case of yogurt. The trick is, you gotta be quick, with over a thousand twitter followers the game usually only lasts a few seconds. I just won again today. I'm going to try their honey flavor this time. Can't wait for the case to arrive. You can follow them on Facebook here. They're always coming up with new recipes and great ideas to incorporate greek yogurt into your daily menu. 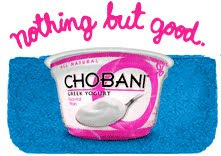 Have you guys ever tried Chobani? What's your favorite flavor? Have you made any recipes with greek yogurt? I tried the pineapple Chobani and liked it, but truthfully, I am a Fage fan - I like the thickness! Glad you found something you love - it makes it easier to eat healthy, right? I too eat Fage...I can pretend its cream lol. I have compote with my yoghurt - beats any artificial fruity addition hands down. So nice is it, that I posted a recipe for it on my blog couple days ago..go check it out. BR. greek yogurt is so much more expensive it seems. I stick with Stoneyfield Farms organic yogur in vanilla or strawberry low fat and it is SOOO creamy i don't long to change. Im not a hugehuge yogurt fan but when I do eat it its always greek yogurt. If I said nothing you would think nobody had noticed. If I say something it might be thought to be checking up on you - do I say something or nothing? Nothing = Cara's not been here in a while but I am ignoring it - she is around somewhere doing something. Something = You ok? we haven't heard in a while. Also noticed that Twitters not been twittering much either....just checking! shey just found your blog wondered if you have come across anything about weight loss and upper arms..have big arms and am lossing everywhere but there..any advice..im worried about lots of loose skin on my arms after can you help? please use my e mail to answer back thanks! I'm not a fan of Greek yogurt even though it is much healthier. I prefer my sweets to come from real sweets. So, I splurge every once in awhile. Like when I had to plan for my wedding, I went around taste testing Sydney Wedding Cakes in order to find the best one. I had to cut back my calories everywhere else so that I could have fun with testing all those yummy cakes! Can I throw in the towel now? ?